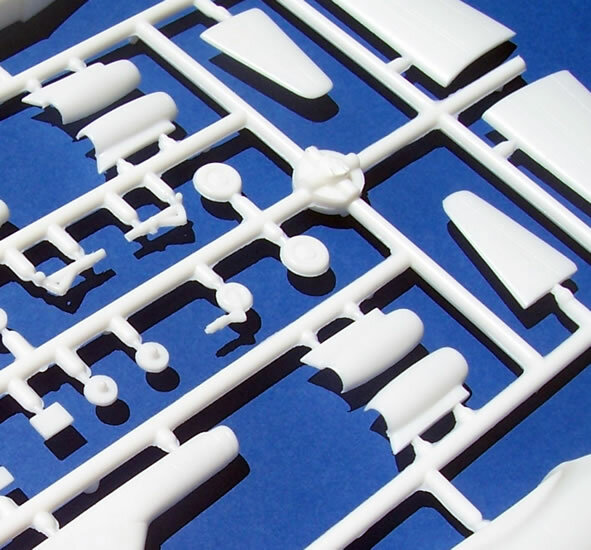 31 x white styrene parts & decals for two or three subjects depending on boxing. Other AZ Models stockist that may carry these kits can be found here. Simple kits with attractive markings. 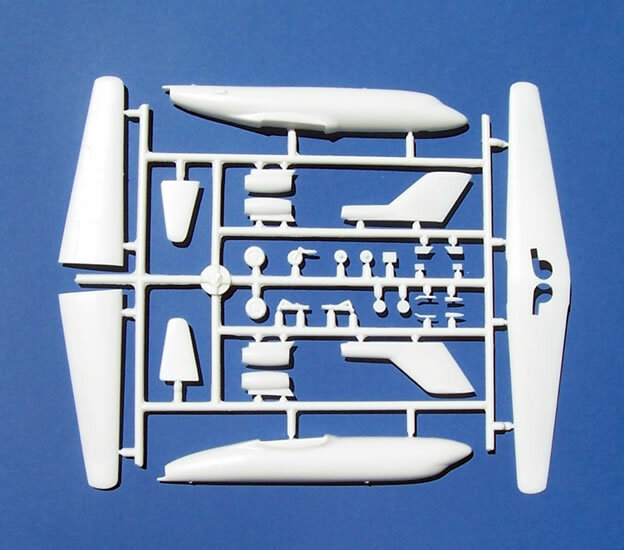 The kits’ simplification possibly limits the OOB finished kits to resembling diecast airliner models. Should be a simple, fast and generally enjoyable build of an attractive aircraft with nice markings – Recommended. 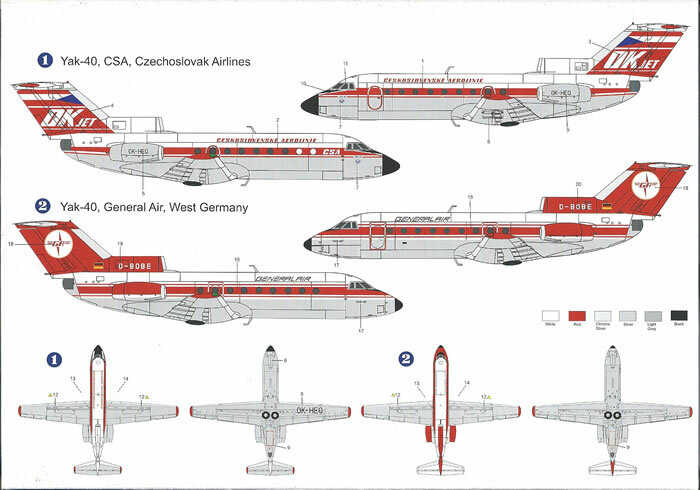 The Yak-40 (NATO reporting name “Codling”) first flew in October 1966 and was introduced to service in September 1968. It continued in production until 1981, by which time in was in worldwide service with Eastern-bloc and various 3rd World client states of the Soviet Union. The two kits are identical aside from markings and box-art, so from hereon I shall refer simply to the singular “kit”. The kit comes boxed in a typical end-opening box with photo-style box-art, with the painting & decaling guides on its rear face. Colours have generic names and are not cross-referenced to any colour system or model paint codes. 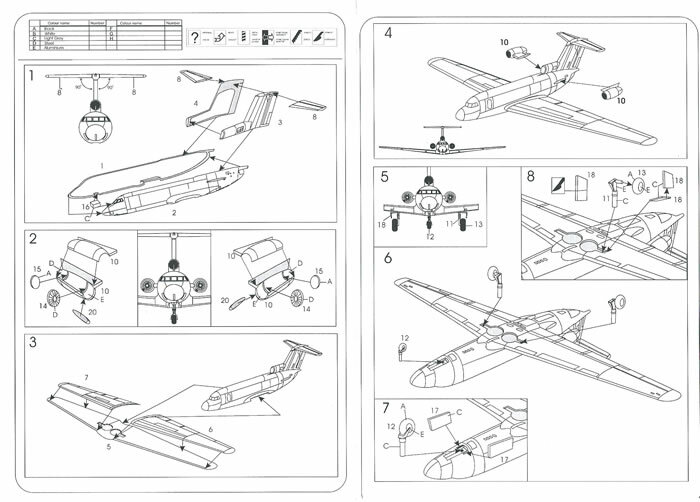 The instructions have a brief aircraft history, parts map and simple but adequately clear assembly diagrams. The last page has some plans that serve no particular purpose other than to illustrate panel lines. 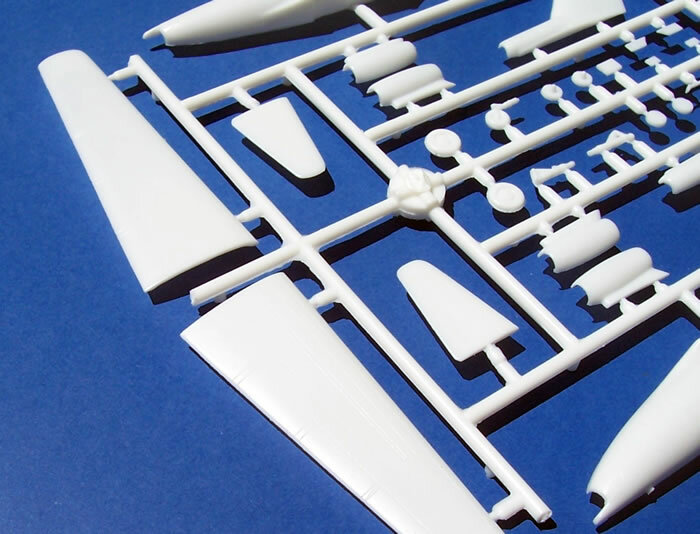 This is a very simple kit in terms of parts count, and I think that it will generally build easily enough, although no doubt some filling will be needed around the engines and tail because of the number of joins in that area and the limited run nature of the kit. Before proceeding I must apologize for my photography, as my photo taking and editing skills were not up to handling the challenge of white plastic viewed in bright sunlight. Readers will therefore have trust me in my description of the parts as the evidence may not always be there to see in the accompanying images. 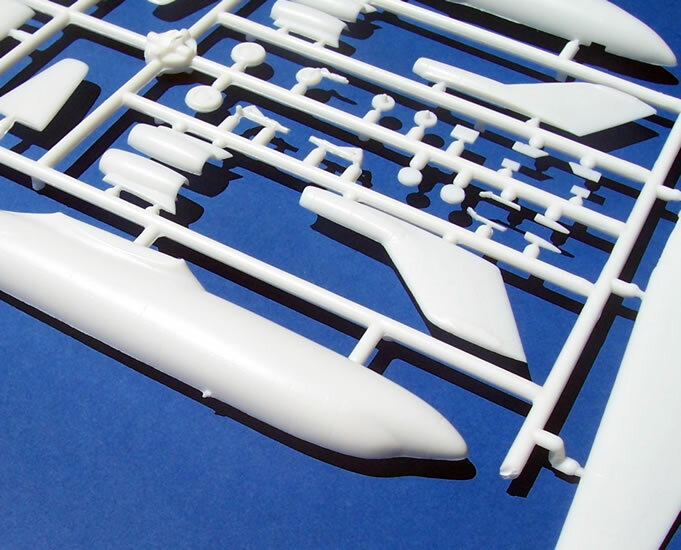 Panel lines are engraved finely enough but the trailing edges of the flying surfaces will benefit from thinning down. Detail on the undercarriage parts is simplified as might be expected in this scale, although this does not mean to say it should just be accepted, as other brands like Platz manage far finer results in this scale. The wheels and legs will also need some cleaning up in places. There are no clear parts for windows, these instead being represented by decals. Again this is not all that unusual with this type of subject, and quite a few builders fill in clear windows when they are supplied for small scale airliners and elect to use decals instead. This approach generally works well in 1/144 and smaller scales, but to me also renders a slightly die-cast model appearance to the finished result. It’s fair to say that this is a fairly basic kit that should build easily enough, although I doubt it will escape needing its share of filler. 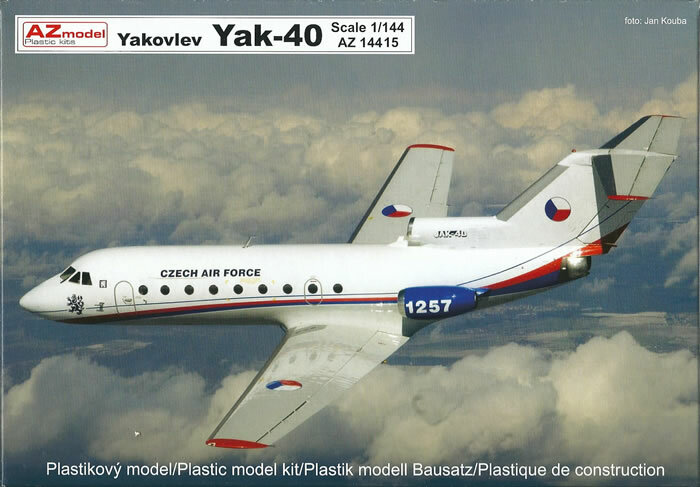 As dedicated 1/72 builder with numerous 1/72 AZ Model kits, I know that they would have provided more detail if this and been a 1/72 scale fighter whose plastic parts amounted to the same size as this 1/144 Yak-40. I’m left with the feeling that the kit is pitched at modellers who AZ Model thinks will accept less. Without wishing to offend our Braille-Scale Brethren, this may be true to a degree as it often seems to me that a lot of small scale airliner kits are finished as pristine models serving to display attractive liveries, and resembling pre-finished die-cast models to a degree. There’s nothing wrong with this, and this kit meets such a need competently. But I have also seen 1/144 kits finished as quite stunning scale replicas with high levels of detail. 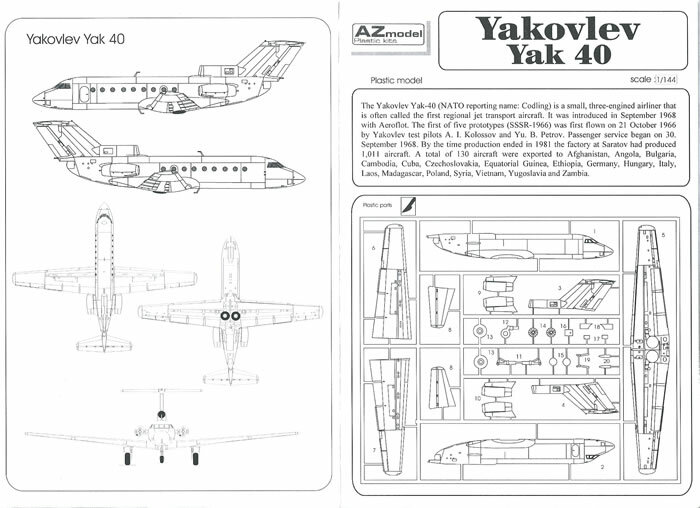 If this is your aim for the Yak-40 then you need to be prepared to a lot of extra work. 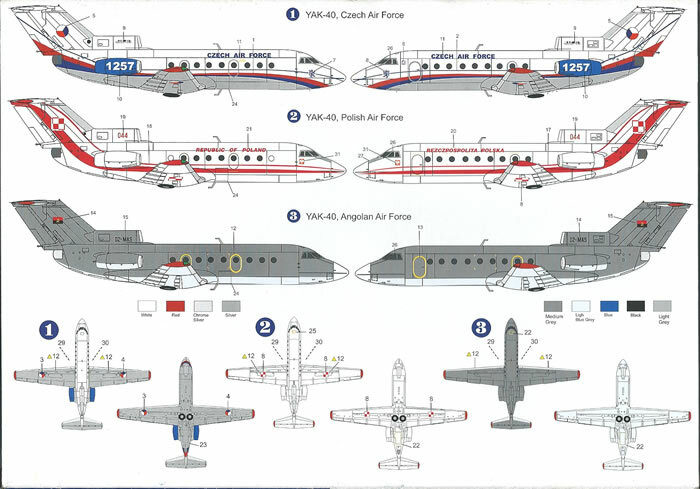 This is a simple kit that seems to be pitched at builders who primarily want a representativeYak-40 shape wearing a nice livery on their display shelf, given its lack of clear parts, and simplified undercarriage detail etc. In many ways it is a simpler kit than even the 1/144 airliners Airfix was turning out in the 1960s, albeit with more refined engraved surface detail. It undoubtedly will build into a smart little model, but for those wanting more detail a fair bit of work will be needed. 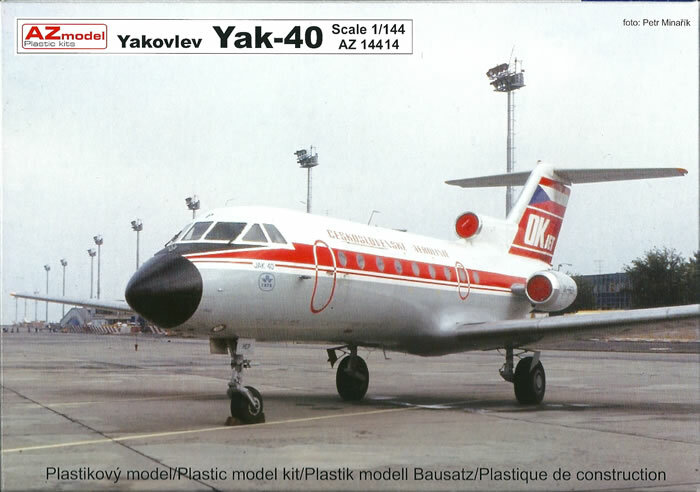 Despite my comments I have to confess the Yak-40’s attractive shape, bright markings and simplicity of construction have an appeal all of their own; sufficient almost to tempt me to build one. Maybe it’s a case of learning not to look through “1/72-scale eyes” (or larger-scale eyes for that matter) and coming to appreciate what 1/144-scale airliner kits can offer in terms of modelling satisfaction and enjoyment - Recommended.